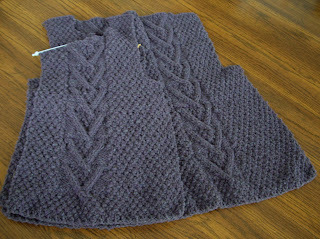 Well, two opera scarves... these took a little longer than two nights to knit, but they were pretty darn quick nonetheless. I knit these for our moms. Notes: I cast on 32 stitches for this. The scarf's on the shorter side, but the width is perfect. The yarn is a springy merino that feels soft in the skein, but feels a little crisp or dry while it's knit up. It washed well, with little-to-no bleeding. I didn't block it very vigorously. Notes: I cast on 29 stitches for this one. 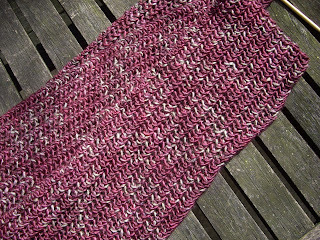 I should have done 32 to get a bit more width; I didn't use the full two skeins, and it's a little too long. 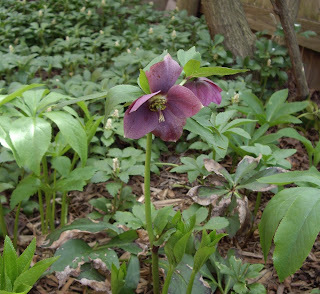 I washed it in lavender Eucalan, and I had hoped not to have to rinse it. The yarn bled like crazy in the wash, so I ended up doing at least 3 rinse cycles. It's not nearly as soft as it would have been un-rinsed -- it feels crisper than the Silky Merino Ishbel in teal that I didn't have to rinse. On the plus side, this has a lacier feel that I really like. 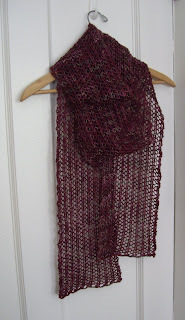 My favorite opera scarf is still the first one that I knit (out of the Plucky Knitter's lusciously soft Merino Cashmere Sport), which has found a home with Melissa of Owl & Acorn for "Pay It Forward." 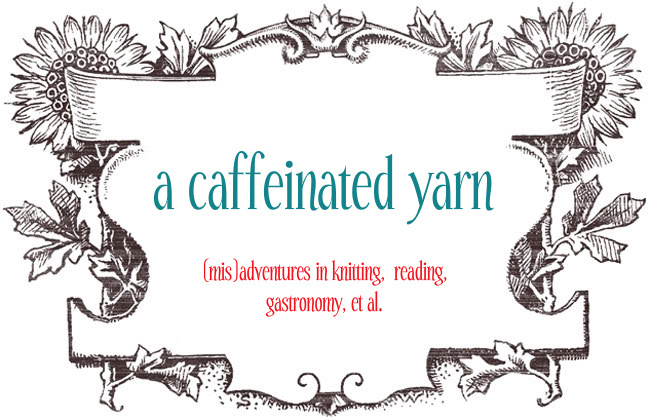 I'd love to have one just like it of my very own -- there's another skein of that same yarn in Captain Wentworth (dark blue) that just might work. She loves pillows and down comforters. 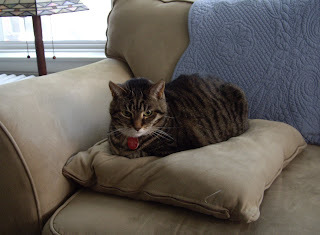 She'll perch atop them, or even use a pillow as a headrest, just like a human. It may have been a little late in coming, but spring fever has hit me hard. Blue skies, sunshine, gentle breezes, chirping birds... heavenly. 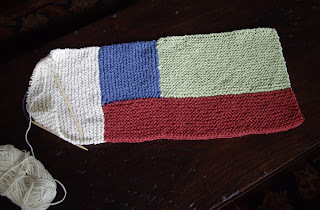 I started a Moderne Baby Blanket (free pattern!) for a new baby born to dear friends of ours out in Boulder. Log Cabin-ing is really fun! This was supposed to be a stash buster, but it's running through the yarn at an alarming rate, so a trip to Loopy is in order this weekend (plus they're having a sale). We had hoped to find a last minute vacation package and get the heck out of Dodge this weekend, but it wasn't in the cards. Turns out I'm actually pretty picky about where I vacation! Who knew... Plus Paul sprained his big toe playing beach volleyball and is hobbling around, plus he caught a cold. So it's probably better to stay put. We are, however, heading up to Milwaukee for a quick overnight trip -- Cafe Hollander, relaxing on the screen porch, and a Brewers game. Here's to a wonderful long weekend! 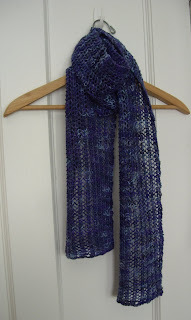 With the bulky yarn and the intuitive lace pattern, this is a very quick knit. I dragged my heels a bit on the finishing, since there was a good amount of seaming and lots of stitches to pick up for the shawl collar and buttonband. I was inspired by Sknitty to knit this pattern, and I copied her in a couple of ways: 1) I subbed 2x2 ribbing for the shawl collar/band (instead of 4x4), and 2) I knit the sleeves first, which was a fabulous idea. The shawl collar/band could use a good blocking, and I need to decide on a closure. Plus I need to find a photographer, some daylight, and a good hair day so that I can post a modeled shot. 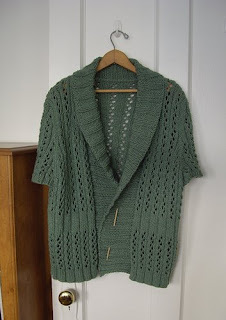 - Drops textured yoke cardigan -- check out Elinor's on Ravelry -- it's gorgeous! I've been using a friend's 10-year old Singer sewing machine that I had borrowed on indefinite loan. She finally needs it back, so I need to start researching machines. 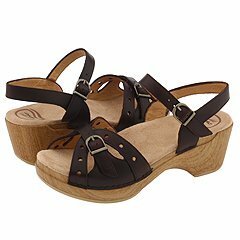 I'm looking for something that's fairly basic, but that is sturdy, reliable, affordable, and can handle machine quilting. 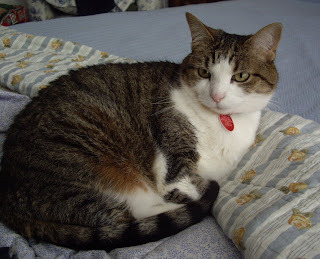 I mainly make curtains, easy quilts, tote bags, and every once in a while a Roman costume or the like. I'm not planning to sew myself any bridesmaid dresses or anything too complicated. Any suggestions? Wilby Wonderful -- a small movie, featuring Ellen Page before she made it big in Juno, and Paul Gross from one of my favorite TV shows, Slings and Arrows. It captures 24 hours in a small island town in Nova Scotia -- the characters are quirky and all have their own travails. It's darkly funny but also kind of sweet. Definitely not a big budget picture. P.S. The Rotten Tomatoes website now lets you add movies directly to your netflix queue. Neat! a yummy and easy brownie recipe, supposedly Katharine Hepburn's family recipe. It's even better when topped with mint cream cheese frosting and chocolate jimmies, but that may qualify as gilding the lily. Cream the butter and cream cheese. Add the powdered sugar and milk alternately and mix until smooth, then add flavorings and food coloring. Spread over cool brownies and sprinkle with chocolate jimmies. On a related note, I bought a Ped Egg at Target last week. I'm very hesitant to buy "as seen on TV" crap, but I'd heard good things, and as much as I love pedicures, there isn't much room in my budget this summer for very many of them. Believe the hype -- it's very effective and easy to use. It's just like a microplane grater for your feet! The back and two fronts are all done, and I am zipping along on the first sleeve. The bulky yarn and heavy patterning is hard on the hands and wrists, so I have to take it a little easy. The Beaverslide is wonderfully soft and earthy feeling; one skein had LOTS of knots, though. I was pleased as punch when I remembered about spit-splicing. I've been knitting with too many superwash wools and blends lately -- that "technique" had slipped my mind! 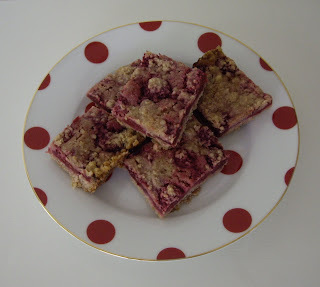 Smitten Kitchen featured this recipe for Raspberry Crumb Breakfast Bars (from Baked: New Frontiers in Baking from the Baked Bakery in Red Hook, Brooklyn) a while back, and I finally got around to trying them. Delicious! They have a wonderful tart bite to them that goes nicely with rich buttery crumb. The initial post had a typo (250 degrees rather than 350 degrees) that made these a bit of a challenge; the link is to the edited post with the correct temperature. The recipe makes a huge batch -- unless you're baking for a crowd, I recommend making a half recipe and use an 8" x 8" pan. How I yearn for the semester system where the end would be in sight already, though! Alas, the spring quarter marches on until mid-June. Somehow I'm actually making a dent in my backlog of knitting projects to block. 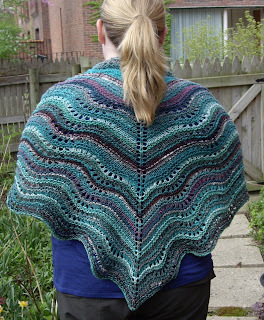 This is actually feather and fan shawl #3, knit during an exceedingly cold stretch this past winter. Notes: Love the pattern -- so much so that I've knit 4 of them. The yarn is soft and cozy due to the cashmere content; however, I miss the sheen of Silk Garden from my previous feather and fan shawls. I would go a needle size larger next time. Also, apparently I really need a haircut. 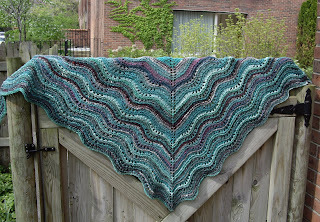 With that, I think it's time to take a break from shawls (esp. feather and fan ones) for a while. Malabrigo Silky Merino in "Stonechat"